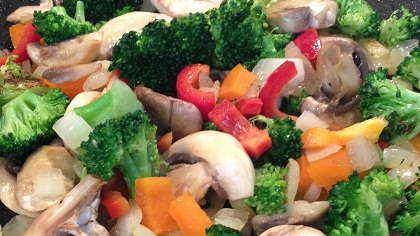 Stir fry is a great option when trying to put a healthy yet quick dinner together for the family. Stir fry your favorite veggies to make a delicious side dish or add lean protein and whole grain rice to make it a complete meal. Clean and cut veggies into similar sized pieces. Heat oil in nonstick pan over medium heat. Sauté veggies until tender soft about 6 minutes. Mix sauce ingredients in separate container. Add sauce to veggies and stir to combine. Remove from heat and serve over steamed brown rice.